Score after 3B Falls in Stands? Does Mariano Get a Save? Which of the following moves by an MLB pitcher is not a balk with a runner on base? (A) Pitcher begins to throw while the catcher is out of the catcher's box. (B) Pitcher drops the ball while on the rubber. (C) Righthander fakes a pickoff to third (with runner on third), then spins to try a pickoff at first. (D) Lefthander fakes a pickoff to first (with runner on first), then spins to try a pickoff at third. Situation: Bottom of eighth; no outs; Brendan Donnelly pitching, Joey Votto on first, Brandon Phillips at bat with a full count. Donnelly steps back off the rubber, then quickly delivers a pitch to the plate. Phillips hits a slicing liner that is snared by RF Brett Carroll. Carroll fires the ball to Nick Johnson to double-up Votto. 1B ump Derryl Cousins, who went out on the ball to RF, calls the batter out. So HP ump Adrian Johnson makes the call at first. However, the 2B umpire Jim Joyce called timeout as soon as Carroll caught the ball. What happens to the batter? What happens to the runner? Suppose the ball Phillips had dropped safely in RF and Votto reached second. A major leaguer deliberately catches a fair ball with his hat. How many bases is the batter awarded? (D) None, the batter is out. With runners on first and second and one out, a batter hits a line drive toward first base. The runner, with the first baseman playing behind him, heads back to first. He is hit with the ball while standing on the bag. The batter hits a towering fly that lands fair in the RF bleachers. When rounding 1B, the batter misses the bag and is called out by the umpire when the defensive team appeals. What happens to the three runners on base? The batter hits a pop fly near the stands along the 3B line. The 3B makes a spectacular diving catch and falls completely into the stands. Is the runner on 3B awarded home plate? The batter hits a long drive near the RF wall. The RF snares the ball just as he collides with the wall and falls to the ground where he lies injured. He has the ball in his glove for three seconds before it trickles out to the ground. Is the batter out? Situation: Bottom of sixth; Jim Thome on second and Paul Konerko on first with one out. Ken Griffey, Jr. hits a pop-up directly in front of home plate. Plate umpire Gerry Davis signals "infield fly." Angels C Mike Napoli misses the catch. Apparently thinking they have to run, Thome and Konerko take off. Napoli picks up the ball in fair territory and throws to third, where Robb Quinlan tags the base but not the runner. Situation: Game 3 of the 2009 World Series. The Yankees enter the ninth inning with an 8-4 lead and Phil Hughes on the mound. After retiring the first batter, Hughes surrenders a solo HR to Carlos Ruiz to make the score 8-5. 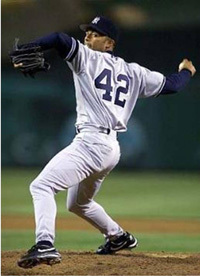 Manager Joe Girardi then brings in Mariano Rivera, who retires the next two batters to end the game. Does Rivera get a save? Situation: A pitched ball hits the batter's finger(s) and his bat simultaneously. Is this a foul ball or a hit batter?